The Gothenburg Symphony Orchestra is playing at the BBC Proms tonight (5th August 2005) with a programme including Mahler (Ruckert-Lieder with Anne Sophie von Otter), Tubin and Sibelius. Their superstar Principal Conductor Neemi Jarvi is ill, so stepping into the breach is 24 year old Venezuelan Gustavo Dudamel (right) who becomes the third youngest conductor to appear at the Proms. As the two younger talents were Simon Rattle and Daniel Harding there is a lot for Gustavo Dudamel to live up to. Several famous conductors got their fairytale big break by taking over at short notice from an indisposed superstar. Probably the most famous was Leonard Bernstein who took over from Bruno Walter to conduct the New York Philharmonic in November 1943 at just a few hours notice. The media are having a field day in the UK with the 'unknown Venezuelan' story, and Charlotte Higgins in the Guardian seems to have swallowed it hook line and sinker with a screaming headline... Conducting prodigy to make Proms debut at 24. Now I am as delighted as anyone that young Gustavo is getting his big break tonight. But the Guardian's story that 'Dudamel is unknown outside his native Venzuela, where he conducts a youth orchestra' is a great example of the facts not being allowed to get in the way of a great story. In fact Dudamel is signed to Askonas Holt. They are one of the world's leading concert management agencies; which means they are a major musical power broker bringing orchestras and conductors together. And their artists include Sir Simon Rattle, Daniel Barenboim and Bernard Haitink, as well as Daniel Harding. Among the 'youth orchestras' on Askonas Holt's roster are the Berlin Philharmonic and BBC Symphony Orchestras. Is a pattern starting to emerge? Moreover the unknown conductor of Venezuelan youth orchestras also has a Deutsche Grammophon contract in his pocket, a company with very strong links to the Berlin Philharmonic. The media also makes much of Simon Rattle's advocacy of Dudamel. This becomes a little less remarkable when you realise they are both under the same management who stand to gain financially from Dudamel's success. And then Rattle is, of course, Music Director of the Berlin Philharmonic who are represented by Askonas Holt......need I say more? So good luck tonight (Friday 5th August) Gustavo, I'll be rooting for you. But I also happen to know that fairytales just don't exist anymore in today's music-like-water world of classical music - except in the minds of PR men and management agencies. 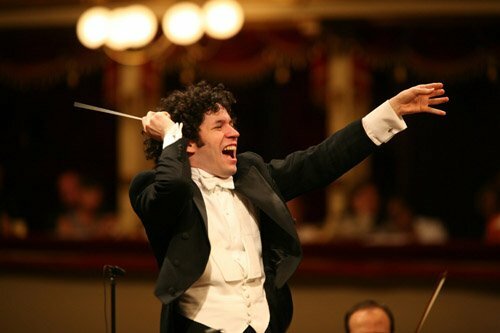 *Judge Gustavo Dudamel's Proms debut for yourself by listening to the live web cast. The concert starts at 7.30pm BST tonight (5th August) . Convert this to your local time zone using this link. Or if you cannot listen-in read the Guardian review tomorrow via this link. See a very useful complimentary post to this story at The Well-Tempered Blog in which Bart Collins focuses on the excellent musical education programmes in Venezuela. When read together these two posts give a much more in-depth and useful analysis of the Dudamel story than that offered by 'mainstream' media like the Guardian. Such is the power of music blogs. You have a great music blog. Love the writings. I note that the Tubin Toccata, in tonight's programme is a victim of the change of conductor. It has been dropped. pliable, besides Bart Collins' excellent Well-Tempered Blog on Venezuela's extensive classical music education efforts, there is also Drew McManus's equally fine three-part blog, at ArtsJournal.com, on his classical music education study trip to Venezuela earlier this summer. The power of blogging times 3.1!! Garth, thanks for that link pointing to Drew's in depth analysis of music education in Venezuela. The resources available across the network of music blogs is just fantastic - particularly when I notice that the most recent news story today (5th Aug) on The Gramophone web site is dated 1st Aug! Support music blogs if you want the hot stories. 20:10 BST and still no show. They're playing the Labeque twins doing Ravel on BBC Radio 3 because there's some kind of technical hitch at the Albert Hall. Yes, you're right. The relay started at 20.25h, as apparantly did the concert. The announcer didn't give a reason, but my guess was that it wasn't a technical hitch. I fear the hall may have been cleared because of a security alert which would account for the 55 minute delay. There is a huge police presence in London today - more than 6000, many armed. Greetings to all the readers...the real genius behind Dudamel's success is the founder and director of the Youth Orchestra Movement in Venezuela, José Antonio Abreu. Someone should follow him and hear his opinions about music and the music business. I have not had the pleasure of seeing or hearing Gustavo Dudamel conduct, but as a Venezuelan myself, I can attest that there are many fine conductors in my country. What favors Dudamel is an interesting constellation of circumstances that matured for him and not for others. I am sure he has true gifts, because, even as the marketing machine works in his favor, he must sustain some interest himself. He has had his weak moments already. The reviews were far from brilliant in Venezuela last year, and Askonas Holt was doing the research for him in the United States on Venezuelan music which could be found in the Youth Orchestra's files. Why were they looking so far away when they could have asked Dudamel himself is still a mystery to me. I place all this in perspective when Marin Alsop has had to fight so hard for a place in the sun of major orchestras after years of work; and I await to see what extraordinary gifts have exalted my young compatriot to such heights above all others so quickly. This story tells that marketing--the shapers of public opinion--seem to be as important to the development of the arts as the artists themselves. Cultural musicologists have been examining this for a while. Whomever pays for the music has determined its direction throughout history. And great and not so great art arose from it all. It is the role of the independent critic to extricate the kernels of true artistic merit, for the sake of the public-- and of the artist. I recall seeing an article a few years back on how the Venezuelans had fiercely promoted musical education to the degree that children in tiny, poor villages were learning to play musical instruments and participate in youth orchestras, resulting in a rich legacy of extremely fine musicians. See the following: http://www.rightlivelihood.org/recip/abreu.htm about the man who spearheaded this movement, and another link http://www.mvdaily.com/concerts/item.cgi?id=221072 about Dudamel being raised through this system. And here’s a link I got from The Well-Tempered Blog on the subject: http://www.vheadline.com/readnews.asp?id=38652 . Anyway, the story of Venezuela and its child musicians has stuck with me for some time now, your recent post triggered it again. I only wish that American education would “get it”—music and arts are the first things for the chop in economic hard times because it is seen as a luxury for rich people, not integral to every person’s well-being. I must thank this site for cueing me to the re-broadcast of Gustavo Dudamel's debut at the Proms with the Gothenburg Symphony Orchestra. Now I can say that I have heard some of his work. I thought it necessary for me to follow up after my previous comments. He certainly has tremendous gifts. One can argue that the details of preparation and subtleties of interpretation may be credited to Jarvi, and that his approach seemed tempestous at times; but given the circumstances and the fear of risks that may have intimidated any other conductor, one cannot deny his love of music and his instinct for the preservation of the structural line of the works. The response of the audience proved that he certainly knows how to generate a climax and project charisma. This has been an interesting month. Thanks to Alsop and Dudamel, one can see new excitement in the press about classical music, since suddenly talents that would normally be considered in the fringes are now occupying center-stage. I hope the audiences--and the marketers--look into the work of others like them, who by their difference, can bring fresh perspectives. These are wonderful times! Just to dish the "Pliable" conspiracy theory, might I point out that Sir Simon is with EMI, not DGG, so it makes YOUR blog sound "less remarkable". Besides, since you also purport that the Venezuelan story is more known than, say, respected reporters such as Charlotte Higgins, suggest it is, you fail to point out that it was Claudio Abbado with the BPO who began the work in Venezuela, NOT Sir Simon. Simon is the one who has - and will continue to - bring the remarkable fruits of the "Sistema" to the media's (and world's) attention. Thanks for posting aminovice, civilized debate is the oxygen which on an overgrown path runs on. I was going to respond by saying that record labels have much less power these days than artist management companies. But then I went on the Askonas Holt web site and noticed that Claudio Abbado (who of course is a DGG artist) is also managed by Askonas Holt. As indeed is Claudio's nephew Roberto, which makes it a real family concern. I am full of admiration for the musical education system in Venezuela, and the links I have posted above have, hopefully, helped in a small way to bring it to a wider audience. I am delighted that leading conductors are working to bring this most worthy activity to the media, and the world’s, attention. But by the same token I do not consider that a reason for not also drawing the reader’s attention to the linked interests of the various parties involved. ...but of course, being interested in presenting a balanced arguement you're interested in pointing out the (exception) writings of the Telegraph and The Times, correct? nor Times reviews of Dudamel’s concert are available online. If you, anyone else can locate them, or other reviews, please post the links. Alternatively, if you would like to transcribe the text of the reviews, with acknowledgement to avoid copyright problems, and post them here, I am sure readers would be very interested to share them. So no hidden agendas. Music blogging is the art of the possible. The Guardian are the most web-friendly newspaper, and that is why their excellent online reviews resource is linked in all my Proms posts. Every situation has its network and its traffic of influences, even the Youth Orchestra Movement in Venezuela. The mortifying question for all of us is--can intrinsic quality transcend and overcome a lack of a favorable network; or, will mediocrity prosper with the help of a network? Since Dudamel is my colleague and compatriot I did try to follow up my listening experience (admittedly a flawed one, through the computer). The reviews available online seem to be surprisingly contradictory. First of all, greetings to my good friend Carmen Tellez. My name is Felipe Izcaray, and I am the Music Director of the Salta Symphony Orchestra in Salta, Argentina. I am Venezuelan, and do know Gustavo Dudamel since he was an energetic kid playing violin in Venezuela's youth orchestra system. Last time I performed with him, he was the assistant concertmaster of that orchestra, and this was on February 1999. How he became a conductor is almost an accident. The founder of the Youth Orchestra Movement in Venezuela, José Antonio Abreu, saw him conducting in his hometown of Barquisimeto, during a music festival. Several months later, the then Youth Orchestra director, Gustavo Medina, resigned his post just a few weeks before an Italian tour. Abreu chose Dudamel to be the tour conductor, and proceeded himself to coach Gustavo, at the rate of 6-8 hours a day. Gustavo was 16 at that time, and did excellent as a conductor. The rest is history. I have seen Gustavo conduct many times, and can call the attention to his charisma, and how he takes his profession seriously. This is one of those rare moments in which the marketing side of our profession unites itself to a real talent. I believe Gustavo deserves the attention he is getting. Through the years he has maintained his easy and warm personality. He is now a DGG artist, a member of the big leagues, and still calls me "Maestro" when he sees me. He greets his old friends as equals, and still imposes his personality when he ascends the podium. Does he have a long way to go?, I have no doubt. Has he begun that journey on the right path? ... You bet your wooden baton! WITH Neeme Järvi indisposed, Friday became Gustavo Dudamel’s Prom debut. Two days before, this 24-year-old Venezuelan had landed an exclusive recording contract with Deutsche Grammophon: a conductor clearly going somewhere. But Friday was also electronic feedback night: the night of the high-pitched hum (composed by Stockhausen, some wags thought) that mysteriously assailed the Albert Hall. For 50 minutes Dudamel was going nowhere. Finally, just before 8.30, he hurled himself upon Tchaikovsky’s fantasia of love and fury, Francesca da Rimini. Every muscle snarled with tension; stand in the way of his baton and you’d be sliced in two. The Gothenburg Symphony Orchestra took the whirlwind in its stride, though the best of the playing — and Dudamel’s conducting — came later. Mahler first. Her face suggested that the wait hadn’t left Anne Sofie von Otter in the rosiest mood, but the mezzo-soprano’s delicacy in the Rückert-Lieder remained unaffected. She reached for top notes as you would apple blossoms. Here was ease and beauty, plus, where necessary, quiet surrender. No quiet surrender in the accelerations and struggles of Sibelius’s Fifth Symphony, music that this polished Swedish orchestra knows inside out. Dudamel sailed through every twist and turn, possibly too neatly; in the finale I wanted more exultation, but we lacked nothing in those eerie passages when Sibelius doodles and time stands still. Hats off to this blog! Imagine receiving a greeting from my good friend Felipe Izcaray! Perhaps the readers will remember my comment about the excellent level of Venezuelan conductors. Felipe and his son Carlos are both stupendous. His perspective is very telling, from someone who knows. (I should clarify that, notwithstanding my participation in this fascinating conversation, I am perhaps the only musician in Venezuela who has not had any direct contact with the Youth Orchestra Movement.) Someone should do a blog on José Antonio Abreu, a man who has changed destinies. Alas, time to stop. Must prepare to travel to Mexico. I look forward to reading what's new in "the Overgrown Path" when I return. Many thanks for all these very valuable posts which have helped paint what is a very complex picture. This story is not only about Gustavo Dudamel. It is also about the importance of music education, a subject evangelised by our own Sir Peter Maxwell Davies (I urge you to read my archived post A musician with teeth and the his speech which is linked to it). It is also about the commercial forces in classical music, which like an iceberg are 90% invisible. I have tried to make those forces more visible with posts such as Music-like-water. I thought long and hard about the recent comment which said I was not presenting a balanced view of this story. To a certain extent that is a fair comment. This is a blog. One definition of a blog is as follows Blog is short for weblog. A weblog is a journal that is frequently updated and intended for general public consumption. Blogs generally represent the personality of the author or the Web site. On an overgrown path represents my personality. And as my wife will testify that is certainly not balanced. You will not find mentions on this blog of composers ranging from Varese to Gilbert and Sullivan. That is not because they are insignificant composers, but personally they mean little to me. The checks and balances can be added by you the readers via the comments and email facilities. This is not hopeless idealism on my part. The reader input on the Dudamel story has been overwhelming. I know some of you have put a lot of effort into transcribing reviews. That is much appreciated. Thanks, it has worked. So please keep the comments pouring in to this unbalanced, but well read, blog. P.S. It is an irony of blogging that the posts that are special to the writer sink like a lead baloon with readers. Would someone now please post a comment on my Peerless Potugese Polyphony post! Dear blogger, indeed, you do not need to apologise for not being "totally fair". It is a futile excercise and also somewhat näive to expect every comment to be fair and objective. You have only to reed the different, contrasting reviews about Dudamel and his Proms concert to arrive to a clear conclusion: A critic exposes his inner, personal feelings about what he hears or sees. It is up to us to digest and make the best of it. An old friend once gave me the answer to the mother of all questions (..."To be or not to be, that is the question"...). I don't know if he made it up, or if it was a borrowed thought, and I do not care, really.